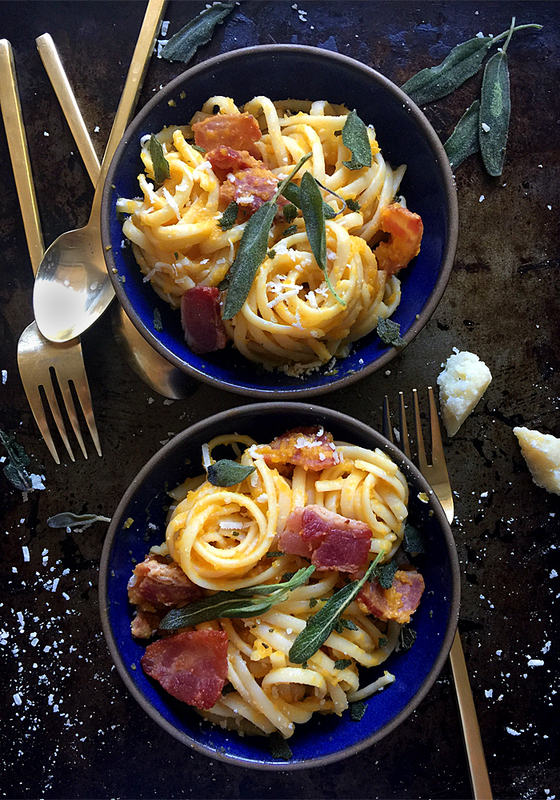 Recipe for Butternut Squash Carbonara Pasta first, my personal notes and shopping resources follow. In a large pan with high sides, heat oil over medium-high heat. Add chopped bacon and cook about 10 minutes until bacon is cooked through and crisp at edges. Remove bacon to a separate plate lined with paper towel to soak up some of the excess grease from the cooked bacon. Leave oil and rendered fat in pan. Add mushrooms and sage leaves to pan. Cook, stirring gently to keep leaves intact, until sage leaves are crisp. Remove mushrooms and sage to plate with bacon. Drain all but 2 tablespoons of fat from pan. Turn heat down to medium. Add garlic and onions and cook until onions are soft and translucent, about 10 minutes. Add butternut squash to pan and cook until squash starts to soften, about 10 minutes. Pour stock into pan, turn up heat to bring to a boil. Turn down heat and simmer until butternut squash is falling apart tender, about 20 minutes. Remove pan from heat. Spoon solids from pan into food processor. Begin puréeing butternut squash and solids. Slowly add stock from pot to food processor about ½ cup at a time until purée is the consistency of thick tomato sauce. Discard any remaining stock. Return the puréed butternut squash to the pan. Taste and season with salt. The sauce may not need too much salt because bacon is salty. Cook pasta according to package directions. Reserve 1 cup of pasta water from pot, then drain pasta of the rest of the water. Add a little more than half of the cooked pasta into pan with the puréed butternut squash sauce, tossing pasta to coat. 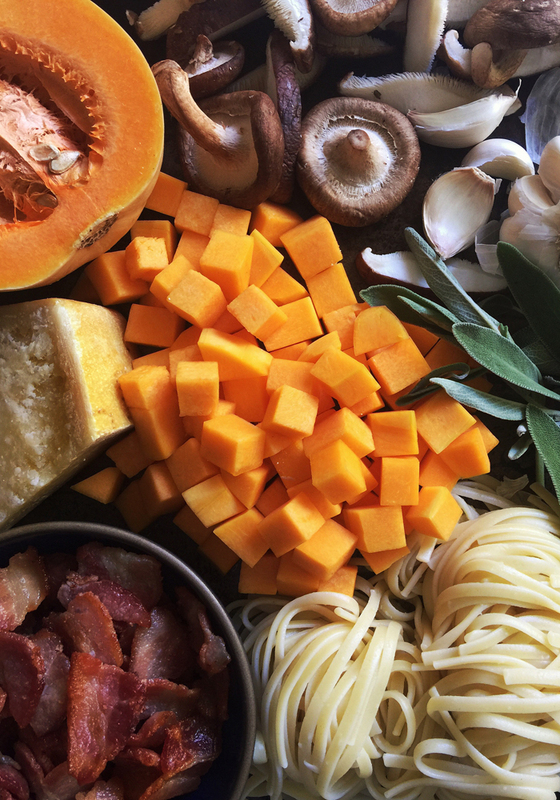 If there is enough butternut squash sauce in the pan, gradually add the remaining pasta and toss to coat until all the sauce has coated the pasta. 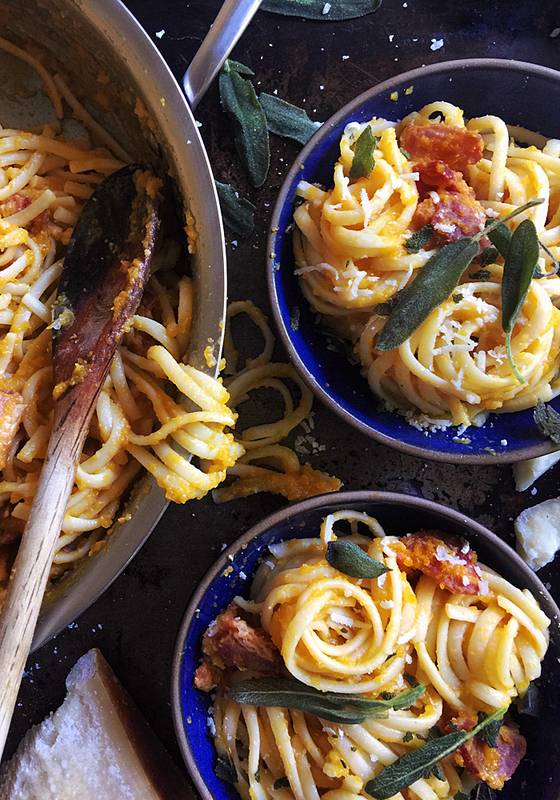 (You may not use all of the pasta, it all depends on how much butternut squash actually fit into 5 cups.) Use pasta cooking water to thin out sauce if needed. Stir in ¼ cup of the grated cheese. 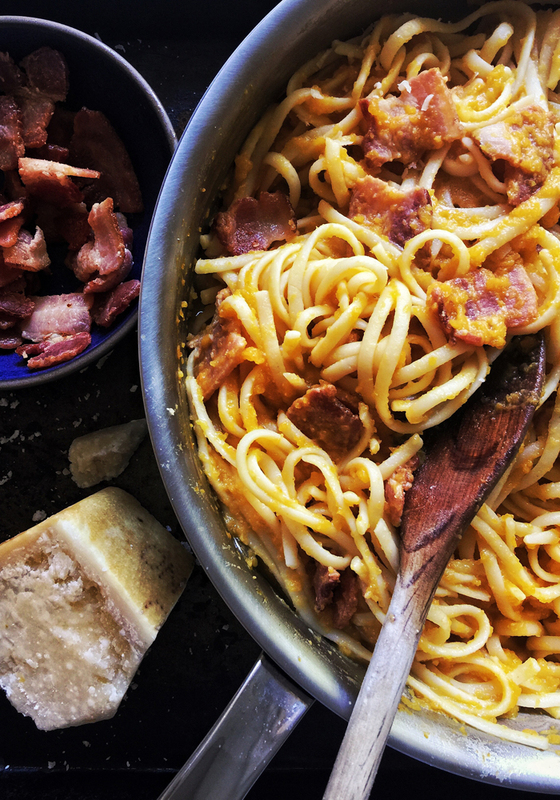 Add about half the bacon to the pot and combine with sauce and pasta. Taste and adjust seasoning with salt. Serve pasta immediately topped with remaining bacon, fried mushrooms, the remaining grated cheese, fried sage leaves, crushed red pepper, and fresh cracked black pepper. Pasta can be stored in an air-tight container for about a day. Refresh in a frying pan with oil and a little bit of water to loosen the pasta over medium heat. Bacon: I used Farmer John California Natural Thick-Cut Uncured Bacon, which comes in 12-ounce package, so it was easy to just divide the contents in half for the recipe, even though I actually cooked all the bacon and ate half of it while cooking. You can use any type of bacon, as long as it’s a slightly thicker cut, and doesn’t have additional flavorings like maple or hickory smoke. Information about Farmer John 100% Natural Bacon here: link. Butternut Squash: Try to use only the “neck” part of the butternut squash. The round body part of the squash that hold the seeds is fine to eat, but somehow seems too string-y for a smooth puree. Garlic: If you really like garlic, double the amount to 8 cloves. Stock: If you are using a very dark brown roasted vegetable or chicken stock, the butternut squash puree will be a darker, browner sauce (but it will taste awesome). If you want to keep the butternut squash puree brighter orange, use a lighter colored stock, or water, or use only 1 cup of dark stock and 1 cup of water. And it will, of course, still taste awesome. I used homemade dark Rich Roasted Vegetable Stock and water. Pasta: I used a dried fettuccine pasta that was on sale at the grocery store. Honestly, any long pasta will work. In fact, even a short pasta will work. Cheese: I used a wedge of Parmigiano-Reggiano and grated it myself into the pasta in the pot, as well as over the plated pasta in bowls. You could probably use pre-grated parm, but why. You can use any hard, salty cheese to grate into the sauce. Vegetarian/Vegan/Gluten-free: To make this pasta vegetarian, leave out the bacon and double the amount of mushrooms. Just fry the sage and mushrooms in 4 tablespoons of grapeseed oil first, remove the fried sage and mushrooms, leave the oil in the pan, and proceed. You can go as far as making this pasta vegan if you leave out the cheese, and even gluten-free if you find a gluten-free pasta you like. I have not yet.